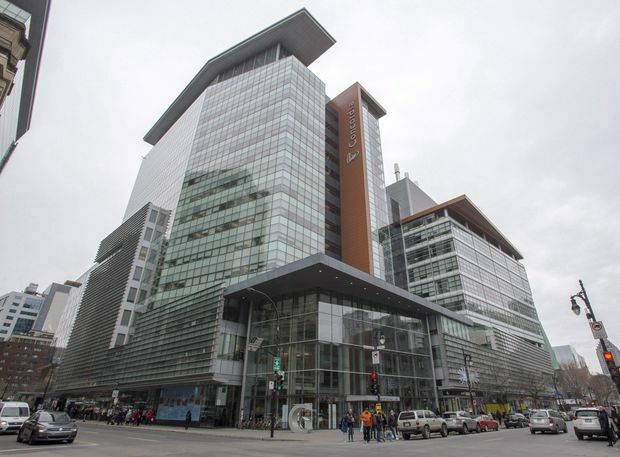 The English department at Concordia University, whose downtown Montreal campus is seen on Nov. 14, 2017, came under scrutiny in January, 2018, when allegations surfaced of misconduct by instructors toward students. An independent review commissioned following complaints of sexual misconduct at Concordia University has uncovered an “unhealthy” climate in the school’s English department. Issues identified in the report published Thursday by a retired Quebec Court of Appeal judge and two psychologists include “real or perceived” acts of sexual violence committed by faculty members. The report defines sexual violence broadly as misconduct ranging from unwanted advances to assault. One recommendation is that professors should no longer hold classes in bars or consume alcohol or drugs with students in other settings. The Montreal university’s English department came under scrutiny in January 2018 when allegations surfaced of misconduct by instructors toward students. The new report is based on a review conducted from April to September 2018 and incorporates input from 109 students, faculty, staff and alumni. It was conducted by retired judge Pierrette Rayle and psychologists Alain Reid and Francois Rabbat. It found evidence of favouritism and discrimination and concluded there is no place for romantic relationships between instructors and students. “The potential for abuse or seriously damaging misunderstandings are far too frequent and serious,” it says. The authors note, however, that the university is limited in what it can do, because the province opted against prohibiting such relationships in the Act to Prevent and Fight Sexual Violence in Higher Education Institutions, adopted in 2017. Students also reported unwelcome flirtatious behaviour from some faculty members. “These students, fearing potential consequences on their grades or careers, can feel pressured to respond positively to the unwanted flirtation,” the report says. Last January, the university announced that it would require instructors to disclose in writing any relationship with a student and withdraw completely from all professional duties relating to the student. Failure to reveal a conflict of interest could result in disciplinary measures for violation of the university’s code of ethics. University president Alan Shepard said the report’s findings are a cause for concern. “We care about the well-being of the Concordia community, and it is distressing to learn of such issues as real or perceived acts of sexual violence, favouritism, discrimination and mistrust towards the institution in the handling of complaints,” he wrote in a message on the university’s website. But he noted that a “very small” number of faculty members are alleged to have behaved inappropriately. He said that many respondents spoke favourably about the English department and that current students reported significantly fewer negative experiences than alumni. The report cautions that only 109 people chose to participate in the review out of a potential pool of 3,228. “This limits the ability of the authors of this report to generalize our findings with respect to the individuals who did not participate,” it says.